Gallia Academy junior Logan Blouir (14) leads a fast break attempt during the second half of a Jan. 18 boys basketball contest against Chesapeake in Centenary, Ohio. CENTENARY, Ohio — An unfortunate turn for the worst. 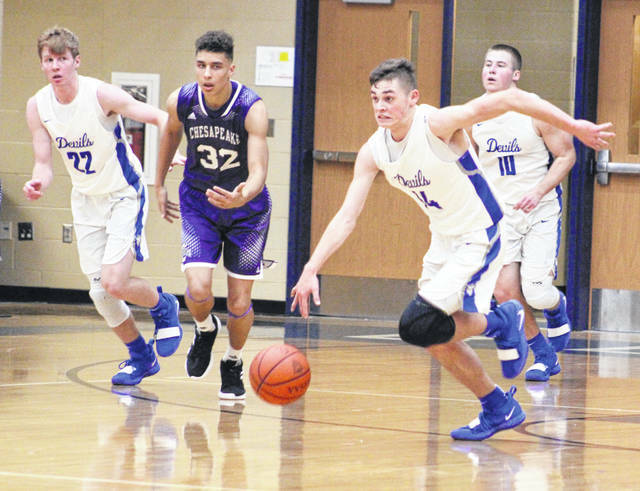 An offensive foul and a double technical at the 1:33 mark of the third period ultimately spoiled a tightly-contested battle of former rivals Saturday night as visiting Warren made a 23-8 surge over the final nine-plus minutes to claim a 53-35 decision over the Gallia Academy boys basketball team in Gallia County. The host Blue Devils (9-6) managed their final lead of the night as Logan Blouir converted a basket for a 27-25 cushion, but Noah Nichols countered with a trifecta that gave the Warriors (11-4) a permanent lead. That 3-pointer also sparked a quick 5-0 run that resulted in a 30-27 edge with less than two minutes remaining in the third. On the Blue Devils’ ensuing possession, Cory Call came off of a screen and moved outside the arc in front of the GAHS bench. Contact was made between Call and the defender as Call tried to establish position, which resulted in the offensive foul call. Both Call and Gallia Academy coach Gary Harrison were issued technical fouls shortly after the play, and the double-foul on Call at the 1:33 mark also resulted in his fourth and fifth fouls of the night. Warren followed by hitting four consecutive free throws to extend its lead out to 34-27, then both teams went scoreless the rest of the frame. WHS closed regulation with a 19-8 charge down the stretch to complete the 18-point outcome. The Blue Devils led 9-7 through eight minutes of play, but the Warriors used a 9-5 spurt to build a 16-14 edge at the intermission. Gallia Academy connected on 15-of-29 field goal attempts for 52 percent, including a 1-of-9 effort from behind the arc for 11 percent. The hosts — who had 19 rebounds and 17 turnovers — were also 4-of-6 at the free throw line for 67 percent. Blouir and Justin McClelland both paced GAHS with 11 points apiece, followed by Call with six markers. Ben Cox and Blaine Carter completed the scoring with five and two points, respectively. Blouir led the Blue Devils with six rebounds and Call added five caroms. Carter also chipped in a team-high two steals. The Warriors netted 17-of-38 shot attempts for 45 percent, including a 4-of-14 effort from 3-point range for 29 percent. WHS had 18 rebounds as a team and also went 15-of-23 from the charity stripe for 65 percent. Nichols paced Warren with 14 points, followed by Clay Miller and Seth Dennis with 11 points apiece. Bryce Knost was next with nine points, while Austin Barta and Gabe Venham completed the winning tally with respective outputs of six and two points. Gallia Academy returns to action Tuesday when it hosts Coal Grove in an OVC contest at 6 p.m.